The rhinoceros family is one of the largest remaining megafauna from our planet’s evolutionary history. Although scorpions are not quite megafauna (thankfully), they too have a lengthy past, dating back 430 million years. Both species have adapted to a wide range of environmental conditions, from the driest desert to the thickest jungle. Considering this, the name ‘Rhinomax Scorpion’ – which initially sounds more like a superhero from a Marvel box office hit than a premium hybrid camper – is indeed fitting for this rugged camper that will help you survive and thrive in Australia’s harsh extremes. 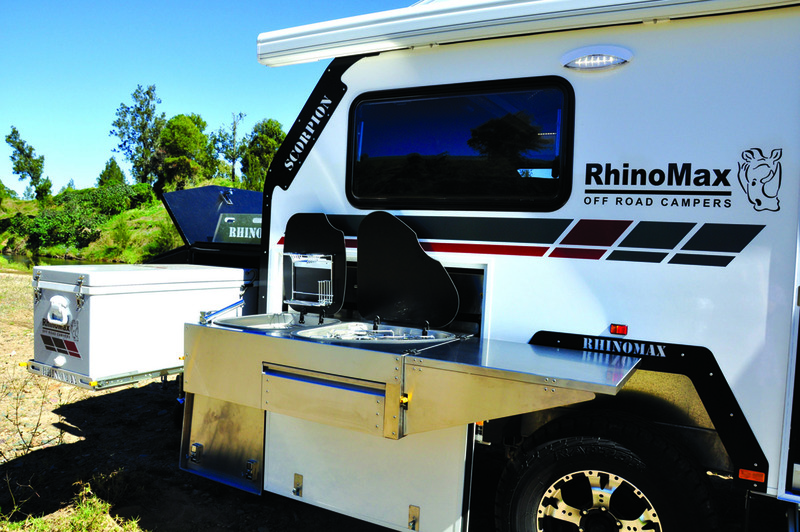 The Rhinomax range of premium campers has always impressed me. They portray a proud respect in their entire presentation. There's Rolls Royce DNA in their design and engineering standards, outback experience in their layout and packaging, and good old Aussie guts and integrity in their ethics. 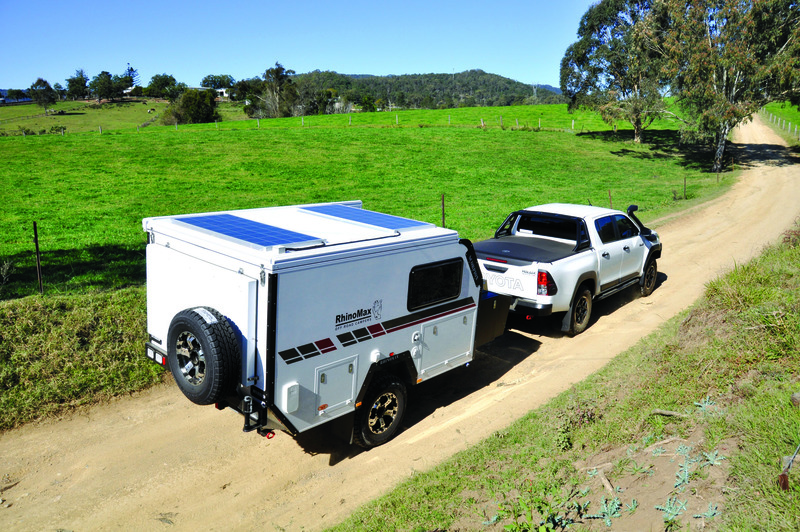 Based on Queensland’s Sunshine Coast, Rhinomax Campers manufacture premium Australian-made hybrids, with only three models in the current range. The inside word is that they will be releasing another two models before Christmas. Whilst they offer optional equipment to serve personal taste and budget, your selection is very easy; the standard packaging is complete with world’s best components and technology, covering plenty of essentials and creature comforts. They are quite right. The Scorpion has terrific offroad ability with its dimensions and strength, but when you come to the end of a successful journey on a tough track it transforms quickly into a flexible home away from home. 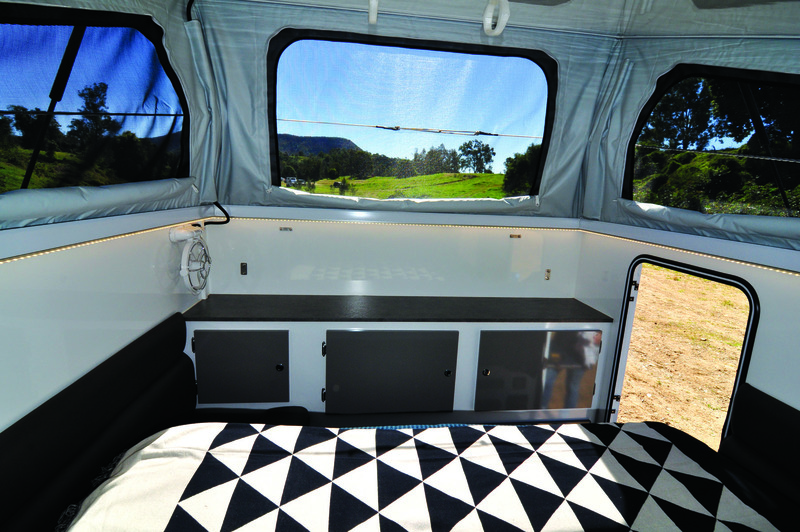 For a simple overnighter it’s only a matter of popping open the hinged roof and climbing straight into the large queen size bed with its super comfy innerspring mattress, individual reading lights, 240 and 12 volt outlets, ample ventilation and plenty of room for bedside storage. You won’t have to visit Greasy Joe’s truck stop when it’s time for lunch on the road. You can simply pull the beaut marine grade stainless steel kitchen out from the kerb side on its sliding tracks to reveal a folding benchtop, three burner stove, large pantry, utensils drawer and sink with hot/cold mixer tap to clean up when you’ve finished. Right next to the kitchen is a further sliding compartment revealing an 82 litre EvaKool fridge-freezer so you can get to food and drinks with ease at any time. If it’s hot or drizzling rain it only takes seconds to wind out the side awning and you’ve got full protection. Should you need to get into the main body of the camper during the day there’s a strong, lockable three-way security door plus a fold-out step taking you easily inside. It only takes seconds, and minimal effort, to pop the roof up. Rhinomax have sourced the finest quality componentry and they match it with excellent manufacturing standards. They start with a strong backbone of a fully welded 150 x 50 x 3mm BHP galvanised steel chassis that runs from the A-frame drawbar to the rear of the 10’ body shell. This allows fully engineered twin recovery points at the rear just in case that bog hole is deeper than you think. But you should be reasonably assured the trailer will emerge, with its 1970mm overall width that runs in the tracks of the towing vehicle. To resist the sand and rock blasting of a million outback miles, or an untimely branch jumping up at you, the floor is fully sealed galvanised sheet – which also adds extra peace of mind for creek crossings. Whilst this is a complete and comfortable hard shell hybrid with an insulated composite fibreglass roof and walls, it still maintains compact dimensions compared to a forward fold camper. With a Tare weight of only 1340kg it’s rather on the light side. Yet this Scorpion shows its strength with a GVM of 2000kg (gross weight can be upgraded to 2200kg or 2500kg) and unloaded ball weight of 110kg. This provides terrific load capacity and lightweight towing – especially considering the number of facilities. 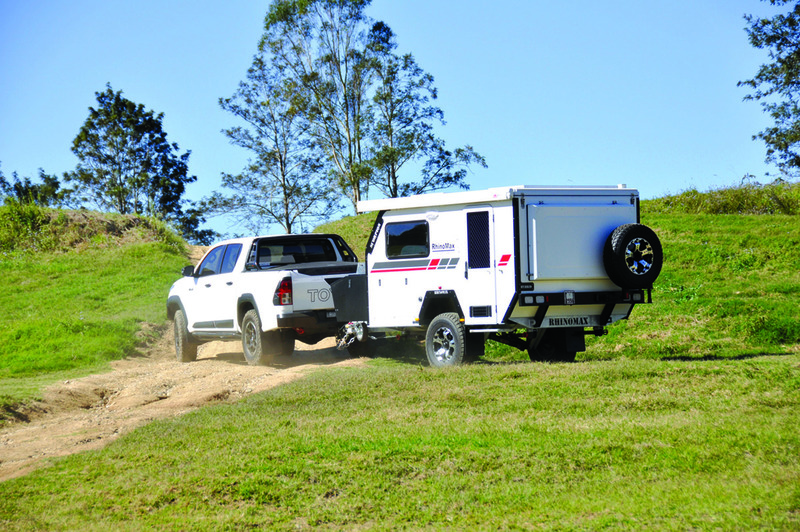 With the roof closed for towing the overall height is 2200mm, making for reasonable head clearance for overgrown bush tracks. Whilst this Scorpion doesn’t have eight legs like its arachnid namesake it is almost as sure-footed. It runs on the unquestionable Cruisemaster XT independent trailing arm suspension with dual shockers and coil springs either side, plus 12” electric brakes. This true offroad traveller has 16” AT tyres with polished alloy mags that can be matched to most towing vehicles. The design creates terrific road clearance for rock climbing plus a good departure angle for tight crevices. Out in front is a DO35 offroad coupling for towing confidence. Our demonstration unit was fitted with the standard 110 litre poly water tank mounted high in the chassis out of harm’s way, and it included an external water draw for creek fills. There’s an additional 85 litre tank available as an option if true long-range venturing is your intent, or you just like long hot showers! The Rhinomax features one of the largest and easiest complete ensuites on the market. 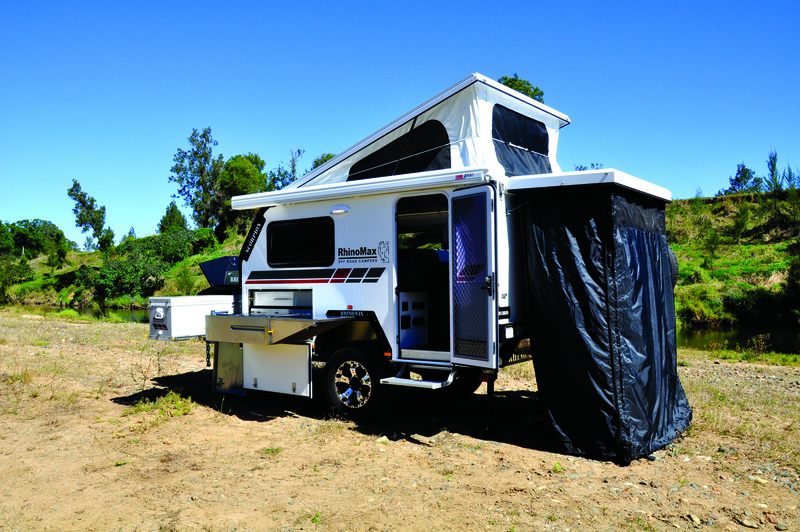 Simply swing out the rear wheel carrier and flip the rear hatch upwards, assisted by its twin gas struts, and the large shower tent drops into place. It has a flexible shower hose and full hot/cold mixer from the Truma gas hot water system. There’s plenty of ventilation and even a pocket for your shampoo – plus plenty of room for a friend if you’ve got one! In my campsite the ensuite tent also becomes the site for the porta-potti, especially during the day. But for total flexibility there’s a secure hatch in the driver’s side where the loo is conveniently stored, but it’s also accessible from under the dinette seat should you prefer it inside at night time. Taking a walk around the Scorpion, the first thing that grabs you is the attractive aesthetics. This is a very ‘clean’ looking design, with glossed white insulated wall panels accentuated by black trims and ‘exoskeletal’ supports, plus polished chrome mags and tasteful grey/maroon decals. There’s something about the look and demeanour that just speaks solid confidence to me! 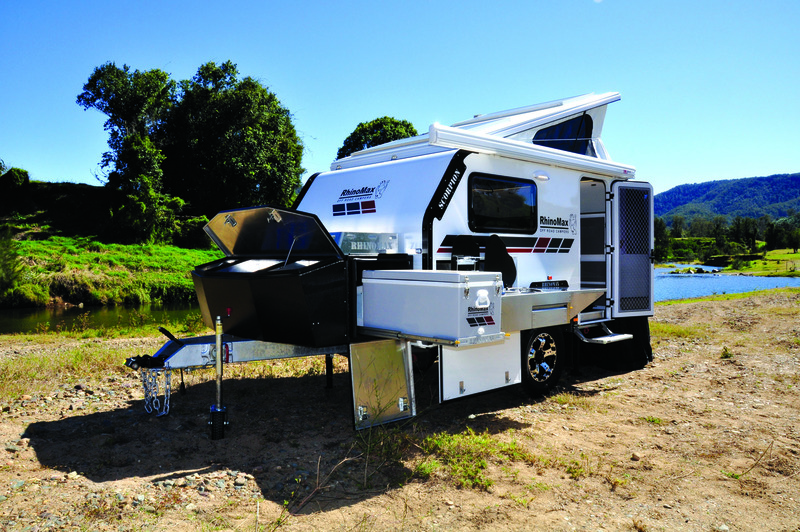 Out in front of the main body shell is a full width storage box that offers safe and secure storage for twin gas bottles and four jerry cans, plus further room for a generator or barbecue. The box has a hard wearing, stone-resistant coating and it angles downward at the front to reduce any possible kick back to the towing vehicle. Up on top is a handy wood rack/luggage carrier that is also terrific for carrying wet and muddy items. 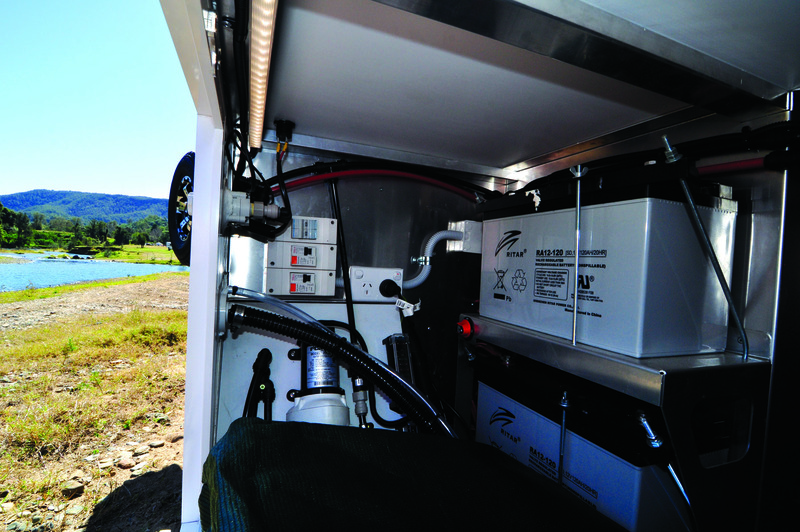 The driver’s side has a huge forward compartment that is large enough to carry a fold-out table and chairs, while also allowing easy access to the batteries, water pump and fuse panel. In the rear is the portaloo compartment and in the centre a lockable water filler and water pressure reducer for mains connection, plus the 240 volt power inlet. 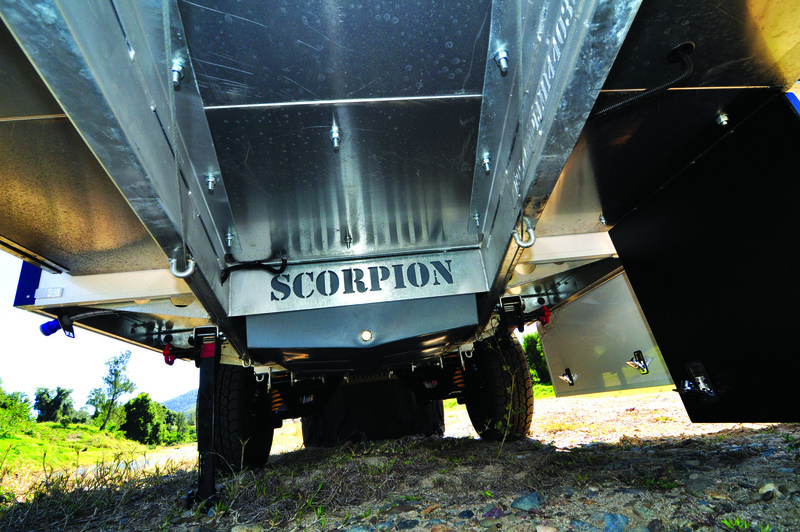 The Rhinomax Scorpion has enough power to keep you off the grid indefinitely. It all begins with the varying voltage inputs and storage. There’s a 240 inlet on the driver’s side for generator or standard mains power connection, with a variety of convenient outlets throughout. There’s a very complete 12 volt system including the Anderson plug, 320 watt solar panel on top, Redarc battery management system (BMS), a DC to DC charger and 2 x 120 amp AGM batteries to ensure you don’t run out of power even in climate extremes. The Redarc system is lithium-ready in case you wish to opt for the new and far more expensive batteries. Rhinomax also fit a 600 watt pure sine wave inverter for 240V power to charge your cameras, computers and vital electronics even when you are well off the beaten track. As you step up into the Scorpion the main electronics controls are immediately to the left and easily accessed from outside. There’s a full switch panel for the lighting essentials and water pump, a water tank gauge, bluetooth headset for the entertainment system and of course the Redarc head unit with digital display for the BMS. Those Rolls Royce engineers have designed plenty of comfortable internal space into the relatively small 10’ body. The cantilevered roof pops up to reveal very good head height plus plenty of ventilation from the zippered windows. Light and ventilation are assisted by a large double opening window on either side that has pull-up/down flyscreen and blackout awnings. The ripper queen size innerspring bed tilts up revealing a three seater dinette with an adjustable table and fully upholstered cushions. Under the bed are two large drawers that are perfect for clothes storage, plus there’s handy power outlets and lighting next to the bed. The rear wall has loads of drawers and storage compartments in the functional cabinetry, plus a handy full width benchtop. The internal colour scheme looks great with its brown upholstery and the granite laminate benchtop and fawn cabinetry offsetting the basic white internal panels. It really is very warm and inviting, as is the entire Scorpion. Rolls Royce ingenuity meets good old Aussie strength in the Rhinomax Scorpion. It really reminds me of the strong but often wiry Aussie digger with its attitude and ability. It is one of the lightest comparable hybrids on the market presenting a very high standard of offroad capability. Our poor diggers couldn’t have even dreamed of the level of comfort and features on offer. The Rhinomax crew are just damned good blokes and gals to deal with. This is a proud family business with terrific dedication to their products. Overall the Rhinomax Scorpion is a great little ANZAC digger that proves to be a reliable and capable friend by your side. Well, maybe behind you!